Jonathan Alter of Newsweek, recently sold for a dollar, is now writing for Bloomberg. Unsurprisingly, he's written a hatchet job on Diane Ravitch. 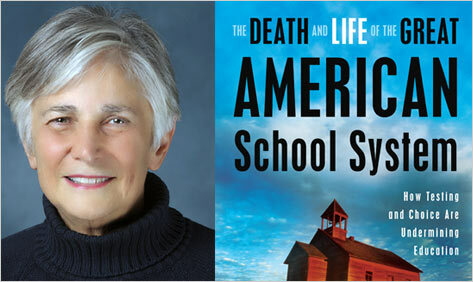 Ravitch, for the unforgivable offense of examining the actual facts about so-called education reform, must be dealt with. Alter does so via an ad hominem piece that might be persuasive to those who have not studied the actual results of "reform." Alter expresses shock that Arne Duncan would speak against her, despite the undeniable fact that Duncan has been on the reform bandwagon since well before he was Education Secretary. Most reformers, according to Alter, are not Scott Walker. They don't want to stop collective bargaining. Take Mayor Bloomberg, Alter's employer, for example. He only wants to do layoffs based on innuendo, on unsubstantiated accusations. He also wants to eliminate right of return, so that the layoffs are actually firings. What could be wrong with that? Arne Duncan simply wants entire school staffs fired, like they tried in Rhode Island, and thinks natural disasters are great opportunities to privatize. Of course, Alter doesn't see how privately run charter schools are privatizing. Alter's been thoroughly refuted at the Public School Parents blog, both here and here, in Accountable Talk, Salon, and in the ceaselessly observant Schools Matter. Of course, with Billionaire Boys' Club money everywhere, he's far from alone. It's unpleasant to be attacked, even when attacks are baseless. Teachers know well, as every day we open the tabloids to find double-paged assaults on our sins, more unforgivable each day. How dare we be paid? Why should teachers have health care or pensions? Wal-Mart employees are barely paid, and have benefits that are essentially worthless. Wouldn't America be a better place if teachers were the same? That's the sort of thinking that goes on in America today, and it's a huge problem. I'm very sorry to see Ravitch attacked like this. Since racism is no longer as chic as it once was, someone else needs to be Willie Horton. For the last few years it's been teachers. 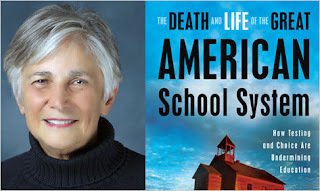 Ravitch, as a truth-teller, has been thrust in our midst. They say people are measured by the company they keep. We've got a very hard road ahead, but standing with people like Diane Ravitch, at the very least, should let us know we're going the right way.